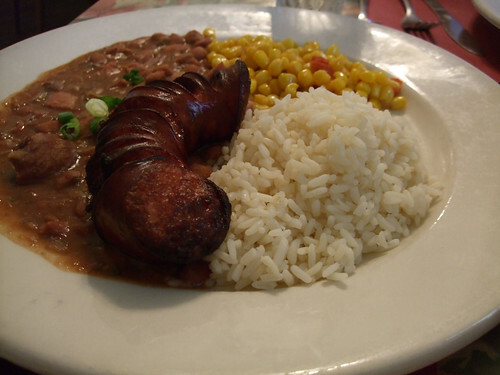 In my restaurant for Valentine's Day on our specials menu we had alligator sausage. We ordered them from a specialty sausage house. I do not make this myself, because I don't have easy access to fresh alligator meat. But if you're lucky enough to have access, go for it. Incidentally the alligator sausage was loved and enjoyed by everyone. In large mixing bowl, combine all of the above ingredients with the exception of the casing. Add one cup of ice water to the mixture and using both hands, blend the ingredients well. Continue to mix in a rolling motion until the fat content of the pork coats the surface of the mixture.This is imperative if the sausage is to be moist and juicy since alligator by nature is quite dry. Once the ingredients are well blended, you may wish to check the seasonings by sauteing a small patty in a frying pan. Correct seasonings if necessary. Stuff the sausage mixture in the hog casing and tie off in six inch links. To cook, poach the sausage in lightly salted water for three to five minutes.Grill over pecan wood or bake in a 375 degree F oven until golden brown, approximately ten to twelve minutes.